Saturday October 22nd, the first day of the annual Bass Player Live event, was not only the beginning of another great show but also could be considered one of the most unprecedented occasions in the history of electric bass. Held at SIR studios in Hollywood, California, there is no other event like it on earth. Starting out the day at the Warwick booth was endorser and clinician Andy Irvine, who not only entertained but educated the public with his extensive knowledge of the intricacies of the Warwick basses. 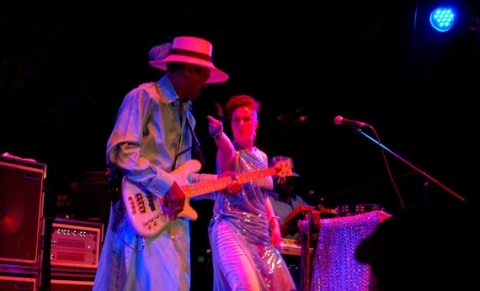 His performance included an intricate jam with famed Fishbone bassist Norwood Fisher. Throughout the day players of all descriptions flowed through the booth and checked out the wide selection of basses and amps and picked the minds of some of best players on the planet about why they chose Warwick basses.It was a great day indeed, but a night of great music was still ahead. Each year, Bass Player bestows the honor of a Lifetime Achievement Award to important and influential bass players. This year’s recipients included Jack Cassady, James Jamerson, Jr. (accepting a posthumous award on behalf of his father) and last but not least, the legendary Larry Graham. everyone in the building saw the depth of Graham’s undeniable influence. It was truly a celebration of the instrument, Warwick, and of course, Larry Graham himself. Sunday started off with an informative and intriguing hip-hop roundtable which included Warwick endorser Divinity Roxx adding the discussion about what it’s like to play with the some of the world’s biggest R&B artists (icluding Beyonce). The day continued with what could be considered a bass players dream: the combination of three of the world’s greatest bassists jamming together. Known as “JoStLe” the ensemble included Jonas Hellborg, Steve Bailey, and Lee Sklar. Attendees of the show had their jaws on the floor while the guys navigated through tunes with world class precision and tastefulness, all the while answering audience questions in between songs. After a bone-shaking bass-heavy jam from Divinity Roxx and her band, the day was closed by a most informative and heartfelt clinic from the master Larry Graham. To an intimate audience Larry detailed how he became the progenitor of the “slap bass” style of playing,his relationship with megastar Prince, his influence on the younger generation of bassist, and much more. It was a fitting end to an incredible weekend of bass playing. Warwick would like to thank all of the visiting Warwick-endorsing artists, all of the enthusiastic attendees, and of course Bass Player Magazine for a wonderful weekend of unprecedented bass playing and a hugely successful period for Warwick. See you all next year!